Welcome to Home And Land Company in Dickinson, North Dakota. Home And Land Company offers you the premier service of the #1 real estate company in Dickinson and the Southwestern North Dakota/Eastern Montana area. Home And Land Company is dedicated to giving top service in all areas including residential, commercial, investment, and farm/ranch real estate. The Home And Land Company agents can assist buyers and sellers in making each real estate transaction a quality experience. 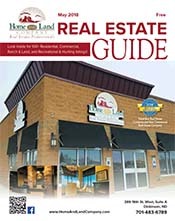 Home And Land Company is the leading company for homes in Dickinson and the rural communities, for North Dakota farms and ranches including hunting land, CRP, and rural homes, and for real estate investments and business opportunities.